A long time ago, in a galaxy far, far away, Snuffleupadata started as a inside joke between a few of Socrata's earliest employees. He stuck with us as a fun, friendly, yet unofficial mascot. As the company grew, the legend of Snuffleupadata was told and re-told, and he invaded our codebase and our hearts. When it came time to pick a company mascot, everyone submitted ideas. From 'Owly the Wise Socrata Owl', 'Socrates" to 'Data Dan', we had many entries - but none as dynamic and frankly as cute, as Snuffleupadata. Once he was chosen as our official employee mascot, we worked with an artist for many weeks to bring him to life. 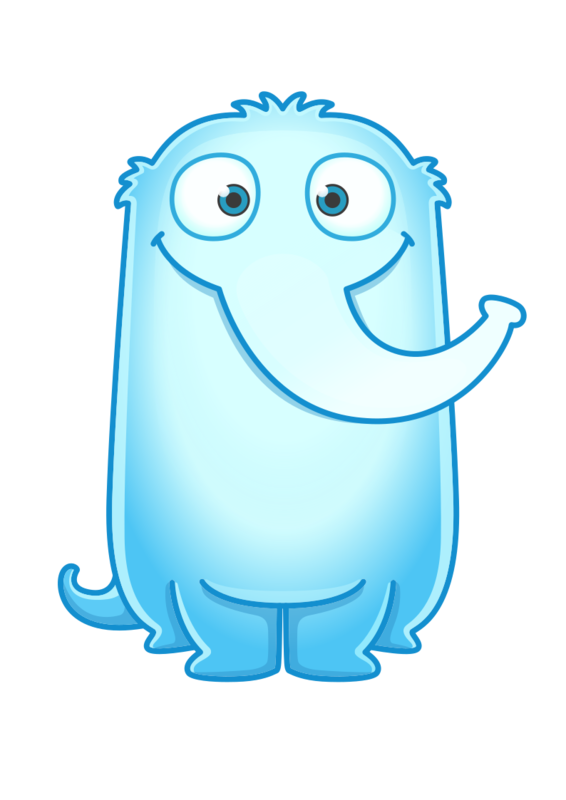 Snuffy was officially re-born in his original form on June 10th 2014, and has won the hearts and minds of many employees, customers and Socrata fans over the past year. He stands for the positive changes we're making in the world though data, but more than anything he embodies the fun, amazing culture that we have and the passion our employees feel about our mission. With his slicked-back ducktail hairstyle, dark sunglasses, and tracksuit, Al Davis paved the way for the Oakland Raiders NFL team to become one of the most successful and popular during the 1960’s. A charismatic character, Al Snuvis, with his motto of “Just win, baby!” is heading up the charge for Socrata as we head into another amazing year! Athena Snu is here to support Socrata’s mission to help governments unleash the power of data. As this Goddess of Wisdom never fights without a purpose, she is well-suited to represent our Socratizens as they continue forwarding Socrata’s mission. Before Snuffy was the big, cuddly data nerd we all know and love, he was the world’s most adorable blue baby. His first words were da-ta and row (though he pronounced it “vow”). Awwww. Barb embodies everything traditional about an HR department; here at Socrata, our People Operations team strives to move away from that vision of HR. By thinking creatively to tackle problems and helping us to celebrate success together, our People Ops team is leading the way to a better way for office HR to be run. Socrata is growing in Europe and our London office is leading the charge in bringing awesome Open Data Solutions to the EU. Cheers! Watch out! If you’re not careful, Burglar Snuffy will swoop in and steal anything he can get his trunk on. Make sure you’re doing everything you can to keep your laptop secured and your passwords strong. Transportation Snus - Meet Cabbie Snu! In preparation for the different transportation related conferences that Socrata attends, Snu is gathering up all of the friendly neighborhood transportation snus! Beep, beep, Cabbie Snu is here to take you wherever you need to go! Snu loves to parter with Code for America, and goes to local and national meetups every chance he gets. He proudly wears his brigade hat as he hacks for change. Captain Snu was front and center at Socrata’s 2017 Employee Summit. Always ready for long days at sea, Captain Snu helmed the ship for the three day gathering of all of Socrata’s employees. It was here that employees learned more about the future of the company and the direction it’s taking, celebrated their fellow Socratizens who received one of four of Socrata’s employee awards, and learned more about each other. Reaching five years of employment at Socrata, let alone anywhere, is a big deal! Our anniversary snu was created to honor and celebrate our wonderful Socratizens that have been with us, through thick and thin, for five whole years. We are so appreciative of everything they’ve done to serve our customers and better the Socrata community. The Socrata Open Data API allows you to programatically access a wealth of open data resources from governments, non-profits, and NGOs around the world. We are company composed of many personalities, but many of us are Civic Developers! To find out more visit our developer portal. It doesn’t get much better than the Classic! Original Snu is what started it all. Our lovable blue mascot has been warming the hearts of Socratizens since his creation on June 10, 2014. Snu is here to welcome you with trunk wide open! The Snu Cone of Shame serves as a reminder to those who forget their badges. Until they relocate said badge, Socrata employees will bear this emblem of shame for all to know. Transportation Snus - Meet Crossing Guard Snuffy! In preparation for the different transportation related conferences that Socrata attends, Snu is gathering up all of the friendly neighborhood transportation snus! Crossing guard snuffy is here to make sure everyone can cross the streets safely! Transportation Snus - Meet Cyclist Snu! In preparation for the different transportation related conferences that Socrata attends, Snu is gathering up all of the friendly neighborhood transportation snus! As cities try to promote alternatives to traveling by car, Cyclist Snu will be front and center, ready to represent! Every year, Socrata throws a big holiday bash to celebrate the year and welcome the next. While in the past, we’ve had a theme for our parties, this year the party was all about dressing to impress and having a classy evening. Snu, of course, was there showing off the best looks: Dapper Snu, Stay Classy Snu, Diva Snu, and Snuffleupadancer. Come one, come all to Socrata’s Public Sector Data Academy! Data Academy Snu is here to aid in the education of data analysis skills to Socrata’s internal customers: government information workers who utilize data to perform their jobs. With Data Academy Snu leading the way, government employees will be more efficient, impactful, and happy in their day-to-day work. In the spirit of democratizing access to government data, Socrata is proud to be a member of the Data Transparency Coalition. In tandem with the DATA Act, Socrata is more excited than ever about how the relationship between government, business, and society can continue to grow. Using the power of the Schwatz, Data Helmet defends the empire from the rebel forces. He is nerdy, his helmet is big, he gets confused a lot…but he looks adorable doing it. Socrata is a big advocate of Women in Tech. Data Snufflace works hard to help us recruit the best female talent into our engineering team. While her expertise is engineering, she also supports our company’s hiring efforts in Marketing, Sales, Customer Success, Admin, Finance, Product and other teams as well! Ring, ring! What’s that sound? It’s the closing of a another deal! Here at Socrata, whenever a member of the Sales team closes a deal, we celebrate by ringing a bell. Deal Closer Snu is always ready to make our Seattle and DC offices loud in the best way possible. Choo choo! All aboard Conductor Snuffy’s train to better data! In celebration of Socrata’s partnering with the US Department of Transportation, Conductor Snuffy is here to keep transportation data readily accessible. So climb aboard and see where the USDOT’s Open Data Portal can take you! Atten-tion! Drill Sergeant Snuffy is here to whip you into shape! It’s a tough world out there and Drill Sergeant Snuffy’s boot camp will arm you with all the skills and knowledge you’ll need to have to be the best data nerd you can be! Without the Socrata Education team, many of our customers would have a difficult time implementing and understanding how best to utilize the tools and programs they’ve received from Socrata. Whether it’s through one-on-one sessions with customers or larger Data Camps held on or off site, the Education team ensures that our customers are best equipped to utilize data in their day to day lives. Our Product Engineering team is always hard at work creating the next exciting Socrata product, solving programming bugs, and crafting some awesome code! As of May 25, 2017, Socrata is FedRAMP approved! Only With the addition of this certification, the company is now positioned to stake an even bigger claim in the cloud service environment. A company’s Finance team is at the core of everything. They count money in, money out, make sure everyone gets paid. Finance Snuffy is our Finance Team’s mascot! Feel free to share them with your finance team too. A part of our Halloween Snu series, Frankensnu is here to give you a scare! Widely regarded as an icon for feminism and the LGBTQ community, Frida Snuhlo was well known for capturing the female form and experience in her paintings. Famous for her series of self portraits, her work served to represent Mexican and Indigenous culture on the larger world stage. We are self proclaimed data nerds, lovers of information, and individuals who want to make a difference. Why not look good while we’re doing it? I actually own a similar pair of these exact glasses! Who better to represent our government customers than our very first President himself? The ever regal George Snuffington is here as a reminder that without government, Socrata would not be where it is today! Snuffy has a fun side, apparently that’s his left side. Go head and get sassy with it Snuffy! We use this Snuffy to congratulate, high five and thumbs up great work and strong performers in the company. One of our core values is Celebrate Success Together, and here Snuffy is doing just that! The Great Snuffsby is ready to wine and dine you! The theme for our 2016 Holiday Party was the Roaring 20’s and a roaring good time it was! The Great Snuffsby was present to make sure that everyone had the time of their lives. Hack Week at Socrata leads to some amazing project ideas, but there can only be one overall winner. The Hack Week Champion Snu is awarded to whichever team, as chosen by peers, comes up with the most creative and successful solution! Socrata’s very first Hack Week was held in 2016, although “week” is a bit of a misnomer as the event itself runs for a few days. This event, driven by and for Socratizens, brings those across the company together to work on interesting projects that can fuel innovation and to find creative solutions to customer problems. For this year’s Employee Summit, Indidata Snu led Socratizens onto their next adventure for the coming year! As the company begins its foray into FY19, the summit served as a chance to bring all Socratizens together to learn about the company’s next steps, interact with those they hadn’t necessarily met before, and spend quality time bonding and getting excited for the year to come! When man and machine unite, it can only mean one thing: It’s time to stand ready or stand back–but don’t stand in the way, or else risk the mighty metallic fury of… IRON SNU. Known as the world’s foremost expert on chimpanzees, Jane Snudall is a friend to all animals. Jane Snudall represents female anthropologists and all women in science. Snudall is an activist for the environment, chimpanzees, and snuffleupadata. With the heart of a true warrior, this Snuffy knows that Data is Coming and wants us all to be prepared. Jon Snu guards the great wall that divides wild data and good, clean data and makes sure our customers only interact with the best behaved data on the kingdom. In early March of 2018, several Socratizens traveled to New York City in support of the city’s Open Data Week. While there, they met with city leaders and trained folks at myriad NYC agencies. There’s nothing Lady Snuberty loves to see more than Socratizens working alongside its government customers! Princess Leia Orsnua is one of the Rebel Alliance’s greatest leaders, fearless on the battlefield and dedicated to freeing data from PDF entrapment. Luke uses the force of clean data to conquer evil. He stands for justice in the Empire and fights to bring Open Government to all citizens of the World. Malala Snusafzai is the youngest person to have won a Nobel Peace Prize. Malala is an advocate for women’s education and is a worldwide known activist. Malala supports strong women like those on our Socrata team, and is committed to empowering girls just like we are with data. “My mission in life is not merely to survive, but to thrive; and to do so with some passion, some compassion, some humor, and some style.” – Maya Angelsnu. Transportation Snus - Meet Metro Driver Snuffy! In preparation for the different transportation related conferences that Socrata attends, Snu is gathering up all of the friendly neighborhood transportation snus! Metro Driver Snuffy knows the important role that the metro can play in getting folks from point A to point B. Whenever Socrata visits colleges, we like to bring Snu along! Here, Snu is rocking a classic and comfy MIT hoodie, all in the name of Socrata’s recruitment efforts. As a representative of the IT team here at Socrata, Moss is here to make sure all of your IT problems are solved! With a cup of coffee firmly in trunk, Moss is ready to take on the day! Mountie Snu was excited to attend the Canadian Open Data Summit this year! The summit was hosted in the city of Edmonton, a long time customer of Socrata’s. Both the City of Edmonton and Strathcona County are considered leaders in making government data open and accessible. Attendees were able to hear about others’ experiences and share ideas about how best to continue making open data a reality. Thousands of people from across the United States will come together for National Day of Civic Hacking. Socrata attends hacks across the country in support of this inspiring event. And of course, Snuffy is there with bells on. Socrata is leading the way through data in bringing police and the communities they serve together. The Socrata for Public Safety platfrom is especially designed for public safety departments, allowing for more accessibility to important crime data and increasing accountability and trust. Every year, Socrata throws a big holiday bash to celebrate the year and welcome the next. The theme for the 2016 holiday party was good old, classic Rock ‘n Roll. Snu always likes to have a good time so he invited four special guests to come and celebrate: Jimmi Snuffrix, Kurt Snubain, Snuffl Rose, and Snuffy Lauper. The four helped to keep the party rockin’ late into the evening! Undercover Snu is scoping out the situation, popping up in the unexpected to make sure your data is secure. He tests the system, pushes the limits, and reinforces firewalls to prevent any bad guys from contaminating good data. In celebration of Cam Caldwell’s 5th Anniversary, Socrata went big with a company-wide celebration. In attendance were two Chuck Norris themed Snus, as Cam himself is frequently compared to our bushy, bearded Chun Snuk Do and Texas Ranger. We love our Federal Government Customers! Snuffamin Franklin works closely with the Fed to ensure their most important data is well taken care of. He has brilliant ideas and an electrifying personality. We wouldn’t be the same without him! Presenting Snufferys Databorn of the House Targaryen, the First of Her Name, the Ungenerated, Queen of Pioneer Square, Queen of the Snuffles and the Developers and the First Cloud, Khaleesi of the Great Information Sea, Breaker of Fabrications, and Mother of Dragons. A warrior at heart, a man of the people, a carrier of justice a defender of the innocent. Snuffiam Wallace is here to fight for FREEDDDOOOMM of Data and the Open Data Movement! Snufftorious RBG is here to represent the second longest serving female justice on the supreme court. She represents women in power and fairness for all who seek justice. To go hand-in-hand with the 2016 Summer Olympic Games, Socrata held its very own office olympics. Socratizens from the DC and Seattle offices, along with remote folks, formed teams of 10 to compete in myriad individual and team challenges. A highlight of the summer, many laughs were had and good memories formed, all in the name of being crowned Socrata olympic champions! Snu Paul is here to slay! So gentlemen, start your engines and may the best woman win! Snuthulhu was created as we enter the time of year where the veil between ours and His dark dimension thins. We thought it would be wise to honor him, lest he chose this moment to wake from his watery slumber and again enslave us in the darkness (and because the name works so well). Snutchulhu is here for Halloween at Socrata! This year, Socrata Connect was held in DC, bringing together all of Socrata’s customers for a two day summit followed by a data camp. It is here that our wonderful customers are able to share their experiences, challenges, and insight into how their city or organization is utilizing data and Socrata to better understand the problems and challenges they face and to better serve their constituents. Sombrero Snu was created by one of Socrata’s original employees, Chris Metcalf, in response to the new requirement for security badges. Always a rebel, Sombrero Snu protested the need for a badge, but ultimately lost the battle. Here at Socrata, we have our fare share of trekkies! Spock Snu wants you to live long and prosper. Is your data portal broken? Are your customers unable to interact with your API’s? Having trouble visualizing your data? Have no fear, Super Snu is always near! Ba - da, da, da, DAAA! Uh oh! Looks like you’ve run into some technical difficulties! Please be patient while the IT team looks into the problem. Health Data is important to everyone, no one knows that better then Dr Snuffy. When not making an appearance at Healthapalooza, Dr Snuffy spends his time ensuring that CMS and other agencies deliver their data to all constituents in the most useful way. Tron Snu is here to welcome you to the future of data! Socrata has joined Tyler Technologies to accelerate data-driven innovation in government and Tyler’s #ConnectedCommunities vision. Snu is very excited to join the Tyler Team! Uncle Snu wants YOU to be a part of the Socrata family! Do you think you have what it takes to be a Socratizen? Socrata’s Security team is always on the lookout for potential threats. They and Undercover Snucurity work tirelessly to ensure that Socrata can safely go about its day to day activities. Snu is always on the lookout for quality Socratizens! Here Snu is rocking a University of Washington hoodie, all the better to fit in when trying to attract the open data leaders of tomorrow. Along with Frankensnu, Witchy Snu is boiling up some trouble, just in time for Halloween! Wonder Woman has been lassoing the truth out of foes since 1941, so we’re definitely excited to welcome her to the Snu lineup! We love how awesome our Women of Socrata are and Wonder Woman Snu is a perfect representative of all the awesomeness our ladies bring to the table. Taking after the 2017 World Games in Wroclaw, Poland, Socrata held its own version in its Seattle and DC offices. With events such as sumo wrestling, chair rowing, orienteering, and more, the Socrata World Games offered a fun outlet for Socratizens to exercise their might and work with their teammates. Here, Snu is rocking a gnome hat, as worn by performers from the real World Games opening ceremony, and a World Games medal as Snu is always a champion! The ever-wise master himself knows just how powerful data can be. Yoda Snuffy wants you to go forth and use the force to help governments unleash the power of data for a better society!